Daniel Clowes' comics express every kind of alienation known to man, but in person, he's more affable than apoplectic: Think Mister Rogers with a black sense of humor. Over the past two decades, that humor has frequently surfaced in projects like his graphic novels Like A Velvet Glove Cast In Iron and David Boring and his comic-book series Eightball, as well as Clowes' screenplays for Ghost World and Art School Confidential, both of which he adapted from his own comics. His latest comic strip, Mister Wonderful, runs serially in The New York Times Magazine through January 2008. It's also available online. The A.V. Club recently caught up with Clowes in Oakland to discuss the benefits of censorship, having a low tolerance for animation, and putting off his wedding to do a Ramones video. The A.V. Club: How did you get started with Mister Wonderful? 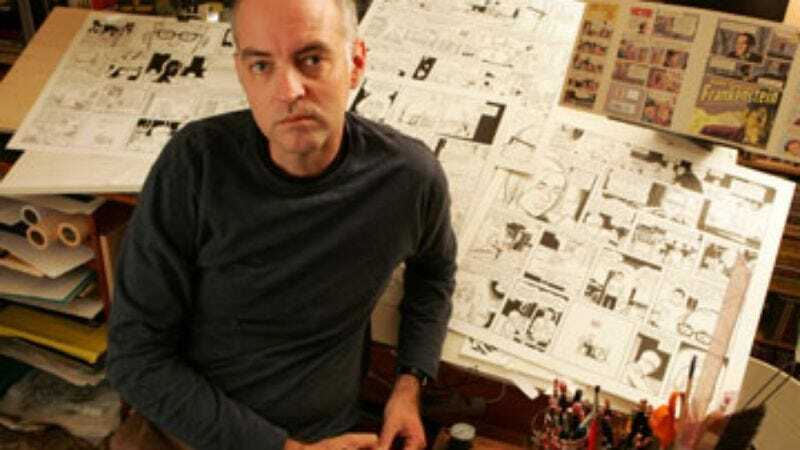 Daniel Clowes: The New York Times has been doing the weekly comic strip for two years. I was the second person they asked, after Chris Ware. I was going to do it about a year ago, until I had to get open-heart surgery. The next opening was in September. I'd always wanted to do a weekly strip, or a strip that was in installments like that. It's been fun trying to figure out how to make that work. Their standards are so prissy that they won't allow me to use all kinds of language. Not only can you not swear, this morning I was informed I couldn't use the word "schmuck." I couldn't use "crap," "schmuck," or "get laid." Those three were beyond the pale. But you get around that, and it comes out better. I can't quite explain why. AVC: Or using cigarettes to indicate somebody's an outsider. DC: You can't do that any more. I used to use cigarettes a lot. It gave somebody a seedy, disreputable, almost suicidal quality. Now cigarettes are so unused––you can't have anybody indoors smoking. If you drew that in a restaurant, you'd have to have a panel where the manager comes over and kicks them out. Unless it's set in Europe, you can't really do that. Characters who smoke––it dates it, somehow. You can have teenage kids smoking, because they still smoke, but that's about it. AVC: The Death Ray would be the obvious example. DC: Yeah, but that's set in the '70s, so you can get away with it there. It was a story I kind of wrote when I was 16; it didn't have any real similarities except for the basic plot. It was something that was stuck in my head ever since I was that age, but I never quite did. So it seemed best to set it in its natural element. AVC: How does the serial format change how you can tell the story? DC: You have to keep it simple, so if a reader misses a couple installments, they can still follow along. I can't tell if that's happening. It's hard to tell if anyone's interested in reading a serialized story. But it's interesting to put in a cliffhanger each week. That was popular in old comic strips. They'd write a weekend story different from the daily strip. So people follow one story day to day, and a separate story on weekends. If you read them, you think "I'll read two more." Then you're like "I gotta find out!" And you read 500 more. AVC: Mister Wonderful is also available on the New York Times website. How do you feel about that? DC: I think it looks better in the magazine. The colors are designed to be on paper, not illuminated on screen. I don't like the aspect of people reading it for free. When people get things for free, they tend to not take them as seriously. But I don't know. I'm sure 10 times more people are reading it online than in the actual paper. People have complained to me, like "Man, that's expensive. Five bucks for one page." Well, you do get a thousand pages of interesting stuff in addition. AVC: A lot of your protagonists are between 18 and 21. What about that age interests you? DC: I see a lot of possibilities in that age. You have a window of opportunity when you leave your childhood behind and have this chance to become what you always wanted to be. For me, that was a time when I could have gone many different ways. I was in flux and deciding what kind of person I would become. There's something interesting about the vision of what that will be and the reality of making that happen, and how you really are what you are. Unless you're "in character," it's impossible to get around that. I can see it in my son. He's 3 years old and has such a clear personality. I don't think it has anything to do with our influence. All we can do is inflect it somehow, but he already is his own person. I always tried to interpret my childhood, to find what events turned me into the person I am today. Now I see that probably none of them did. I probably would have gone in the same route, personality-wise, no matter what. AVC: What can you do with comics that you can't with other media? DC: I never feel there's anything I can't do. There are certain things in comics that you can't do in any other medium: for instance, in Mister Wonderful, [Marshall's] narration overlaps the events as they're going on. That would be difficult in film; you could blot speech out with a voiceover, but it wouldn't have the same effect. That's always of interest, to see what new things you can do in comics form. AVC: What are its limitations, then? DC: I hate to say there are any. Comics seldom move me the way I would be moved by a novel or movie. I say this as someone who would rather read comics than watch movies, listen to music, anything. But it's not an operatic medium. I hear other people talk about being moved to tears by comics. I can't imagine that. AVC: Even for something like Jimmy Corrigan? AVC: There are a lot of little details in your comics that aren't necessarily meant to be noticed the first or even second time through. DC: I just try to make it for myself, try to give it some kind of unity throughout. That often involves tiny details. I'm never sure what's going to be obvious or what nobody will ever notice. I put stuff in my comics that I thought was blatantly obvious, and nobody noticed. And things that I think are buried in the background, everybody gets it. So I try to be consistently aware of every part of the frame. AVC: How does it feel to see your influence in other people's work? DC: I'm usually the last to see it. People give me stuff and say "Oh look, this guy's ripping you off," and I'm like "What do you mean?" Often I see the people that I've ripped off filtered into my own work. In other people's work, I can only see specific, tiny little instances of inflections stolen from another artist. I have a real blindness to my own work. When I look at stuff I did, three or four years later, it doesn't look anything like I thought it did. To answer in another way, it keeps me moving when I see people doing stuff that I see as "my" direction. I think, "Oh, it's been tainted. Now I've got to do something new." There's nothing worse than working on your own stuff and thinking that someone else is following you along. AVC: Does working in comics affect how you view animation? AVC: You did a video for the Ramones. DC: Yeah, and that turned out well. I got the phone call about that project on the first of June 1995, and it was on TV the first of July. It was a month from knowing about it to it being so done it was on TV. It was insane. I would stay up all night drawing pictures for it. At 6 in the morning, this bleary-eyed messenger would come to my door and pick up the latest drawings, take them to an animation studio in Mill Valley, and then come back later and pick up more. I had to postpone my wedding to do that. The greatest moment of my life was, somebody sent me a cable-access show from Chicago that had Joey Ramone on it showing that video. And he was talking about, like, [imitates Queens accent] "This guy Dan Clowes postponed his wedding for us. He's a great guy." [Laughs.] At that exact same time, Mr. Show wanted me to do the logo and opening animation. I would have done it, but I was so fried out by that. Now that's my biggest regret, because I would have loved to have been part of that show. AVC: How does a story relate to its style? I'm assuming you didn't start Ghost World with the idea "I want to do blue now." DC: I might have, actually. [Laughs.] You have to find the tone of the piece and modulate that. There are ways to indicate that—I try to incorporate the biggest range I can within the story, going from humorous to serious without it being jarring. That's the hardest part, to keep that balance. It requires being constantly aware of where you are in the story. You can't really do that in a movie: You can't slightly modulate the tone by the way the character's eyeballs look in this one scene. With this New York Times piece, I veer between drawing realistic eyes and little dot eyeballs, and it holds this strong unconscious meaning in the story. Or maybe not. Maybe nobody cares. Sorry, it's very hard to talk about that. If you think about it enough to have a really articulate answer, you're not doing it right. That's how I feel about art. If your thought process could take you to knowing exactly what you're doing and why, there would be no point in making the art. It would become like propaganda. It's more nebulous than that. AVC: Recently, a teacher in Guilford, Connecticut was fired for giving Eightball #22 to a student. Do you have any comment on this? DC: When the Guilford story first broke, I was contacted by several journalists who wanted my take on the whole thing, and I decided I was the last person in the world who should be commenting on this case. Having no specific knowledge of any of the players involved, I thought I would spare the world another half-baked opinion. Any defense of the teacher's actions boils down, at some point, to an appraisal of Eightball #22, and I'm not the best person to do that. All I can say—and this comes more from my perspective as a father than an artist—is for parents and administrators to give so little value to the career of a public-school teacher—to allow him to be cast aside without exhausting every avenue to resolve the issue—is an obscenity worse than anything I've ever drawn in my comics.